Zero Up™ is a revolutionary software that automates the grunt work and eliminates the technological challenges for store owners. 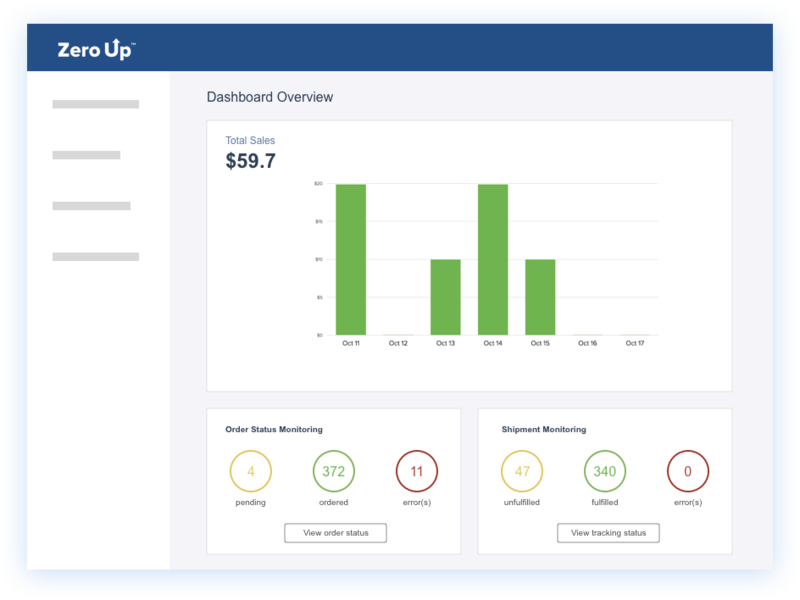 Once Zero Up™ is connected with your Shopify store, it can design and create your entire eCommerce store with a few clicks of a button. Plus, it automates your inventory ordering and contains tools that can help you increase your profit on your store. Didn't find your answer? Need more infomation about Zero Up™? Contact us now! Q: What if I have a WordPress website? Can I still use the software? A: Our ZeroUp™ software is fully integrated with Shopify and it works best if you are creating an e-Commerce business. Q: What if I have a Shopify website already? How can your software help me? A: You can still connect your existing Shopify website to our Zero Up™ software and take advantage of all the features that are available including our pre-designed themes, click-and-drag landing page and funnel builder. Q: Which email autoresponders are you integrated with? A: Our current list is as follows: Sendlane, Aweber, GetResponse, MailChimp, Constant Contact, Infusionsoft, Sendgrid, Ontraport, Campaign Monitor, Aweber, Mad Mimi, Send Reach, and Drip. If there is one that Zero Up™ is not integrated to, we ask you to email our team and we’ll see what we can do to accommodate your request. Q: What is the automated fulfillment and tracking process? A: Your customers can directly purchase AliExpress products on your store and the order will be automatically placed through AliExpress. Once the order has been fulfilled, the tracking number from AliExpess will be automatically updated for the customer so that you don’t have to worry about the process. Q: What does the funnel builder do? A: You can create front-end, upsell, and downsell pages automatically with an easy click-and-drag tool. The pages will be automatically hosted on yours store with its own specific landing page URL.